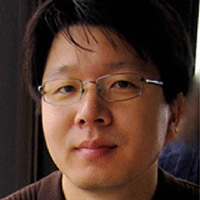 March 8, 2019: MRSEC Seed Investigator Sang-Hyun Oh (Seed) was awarded the 2019 Distinguished McKnight University Professorship, an award given to outstanding faculty members who have recently achieved full professor status. Read the full article from the Scholars Walk. 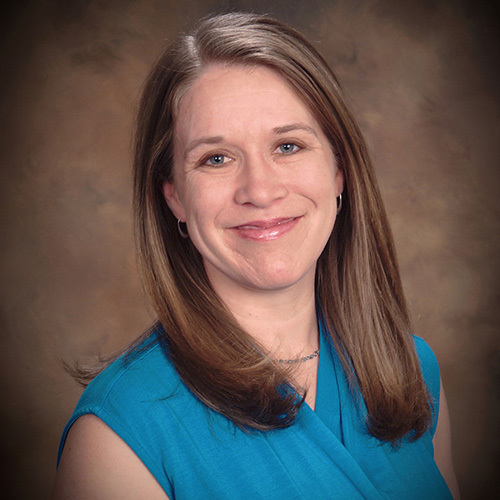 March 8, 2019: MRSEC Investigator Christy Haynes (IRG-2) was awarded the 2019 Distinguished McKnight University Professorship, an award given to outstanding faculty members who have recently achieved full professor status. Read the full article from the Department of Chemistry. 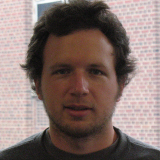 February, 2019: Vlad Pribiag (Seed) is among ten recipients of the 2019-2021 McKnight Land-Grant Professorship. This University-wide program seeks to advance the careers of the most promising assistant professors at a crucial point in their professinal lives. Recipients were chosen based on merit, professional promise, quality of publication record, and originality and innovation in research achievements. 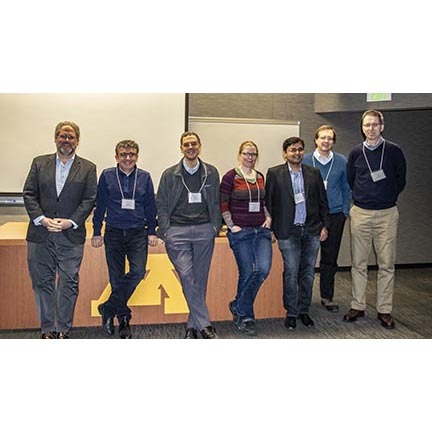 January 31, 2019: The inaugural All-MRSEC Meeting was held on January 31, 2019 and featured talks from Fiona Burnell (SEED), Bharat Jalan (IRG-1), Andre Mkhoyan (IRG-2), Nathan Mara (SEED), Ilja Siepmann (IRG-3), Andreas Stein (SEED), and Ellad Tadmoor (SEED). 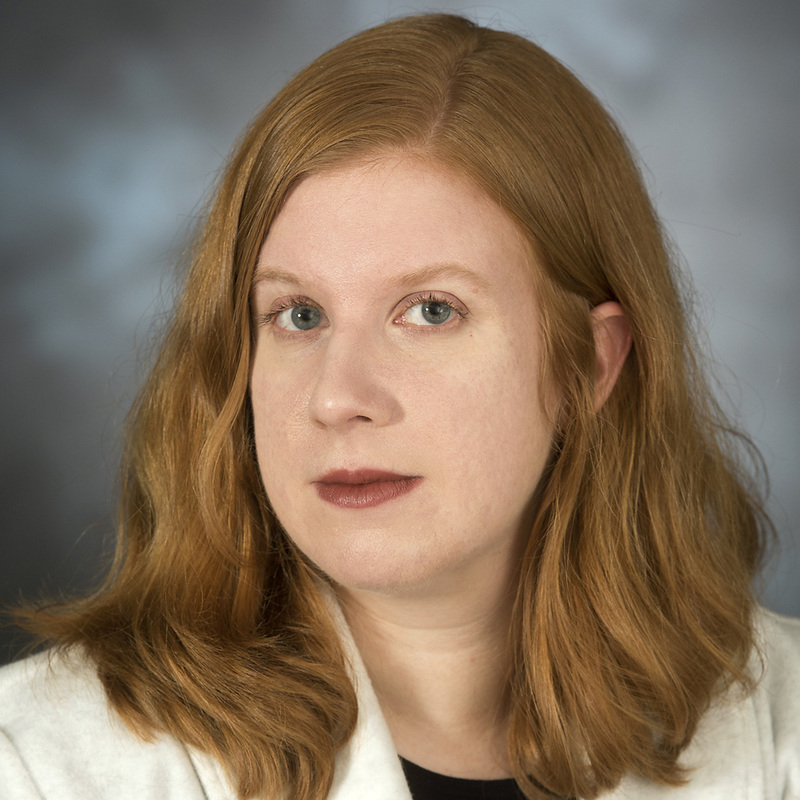 January, 2019: Mechanical Engineering Assistant Professor Cari Dutcher (IRG-3) has received the George W. Taylor Career Development Award. This award recognizes exceptional contributions to teaching by a candidate for tenure during the probationary period. December 7, 2018: Professors Vlad Pribiag (SEED) and Paul Crowell from the School of Physics and Astronomy are part of a group that will receive a $2.25 million grant from the U.S. Department of Energy to develop materials and device knowledge for creating quantum computing. 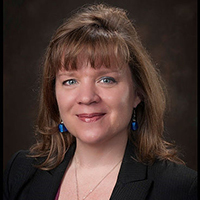 November 15, 2018: Professor Theresa Reineke (IRG-3 Coordinator) is a Fellow in the Big Ten Academic Alliance Academic Leadership Program (ALP) for 2018-19. Established in 1989, this intensive experience develops the leadership and managerial skills of faculty who have demonstrated exceptional ability and academic promise. 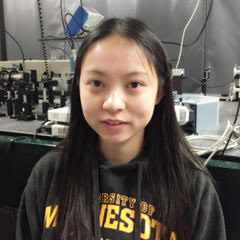 November, 2018: Yingying Zhang, advised by (IRG-2) Professor Xiaojia "XJ" Wang, won the travel grant (highest cash award) for attending the Micro/Nano Forum at the ASME 2018 International Mechanical Engineering Congress and Exposition (IMECE 2018) in Pittsburgh, PA. She presented her work on Molecular Dynamics Simulation of Thermal Interfaces and Experimental Study of Thermal Transport in ZnO-based Nanocomposite Systems. Congratulations Yingying! December, 2018: Intersociety Polymer Education Council (IPEC) provides this award to high school science teachers for excellence in polymer education. The national award winner receives up to $750 reimbursed to attend a NSTA / ACS or other educational related conference, a check for $1000 and a plaque stating their accomplishments. Congratulations Cassie! Dec. 11, 2018: The National Academy of Inventors (NAI) announced that Regents Professor Frank S. Bates (IRG-3), has been named an NAI Fellow. Election to NAI Fellow status is the highest professional distinction accorded to academic inventors who have demonstrated a prolific spirit of innovation in creating or facilitating outstanding inventions that have made a tangible impact on quality of life, economic development and the welfare of society. November, 2018: PhD Student Kriti Agarwal (MRSEC Seed ECE) received a Best Poster Award at the MRSEC 2018 Fall Meeting in Boston, MA. 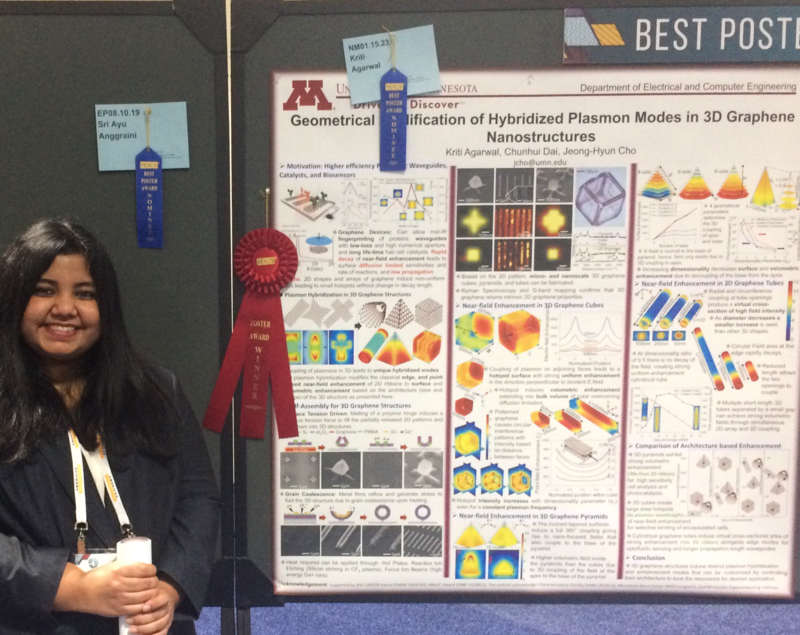 Her poster is titled “Geometrical Modification of Hybridized Plasmon Modes in 3D Graphene Nanostructures.” The Best Poster Award was given to 20 posters out of 2,640 posters over the course of the 5-day meeting! Kriti is advised by Assistant Professor Jeong-Hyun Cho (MRSEC Seed ECE). November, 2018: PhD Student Chunhui Dai (MRSEC Seed ECE) received the 1st Place prize for the best poster at the 2018 International Mechanical Engineering Congress and Exposition (IMECE), in Pittsburgh, PA. Chunhui's poster was chosen as best from more than 100 posters presented at the Exposition. 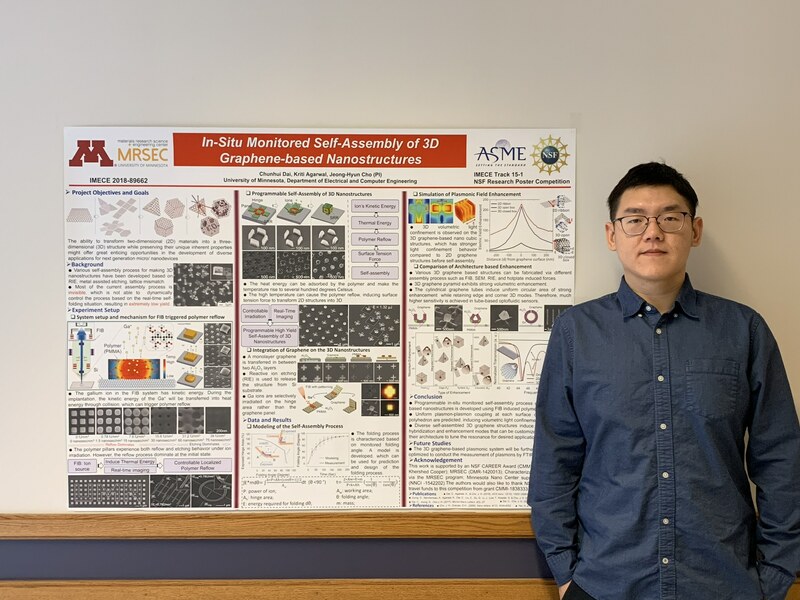 His poster is titled “In-Situ Monitored Self-Assembly of 3D Graphene-based Nanostructures.” Chunhui is advised by Assistant Professor Jeong-Hyun Cho (MRSEC Seed ECE). 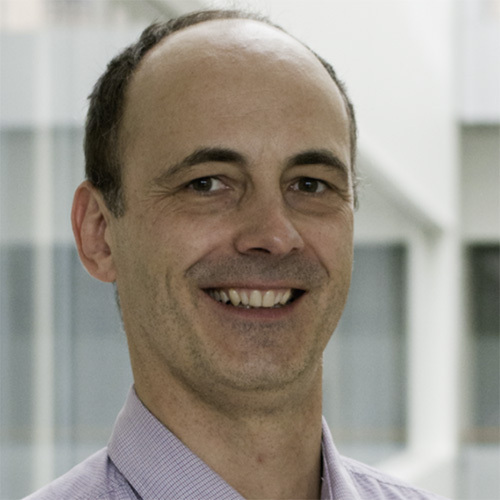 November, 2018: Associate Professor Chris Ellison (MRSEC Seed CEMS) was awarded co-PI on a new National Science Foundation EFRI grant entitled "EFRI C3 SoRo: Strong Soft Robots-Multiscale Burrowing and Inverse Design." The team will study how soft robots of different sizes tunnel through materials. These discoveries may provide access where access wasn’t possible, such as inoperable brain tumors, or buried pipes. The awarded team: PI Tim Kowalewski (ME) and co-PIs James Van de Ven (ME), Emmanuel Detournay (CEGE), Chris Ellison (CEMS), and Kota (U Micheigan). October 26, 2018: Assistant Professor Vivian Ferry (MRSEC Seed CEMS) is one of five women awarded the 2019 Marion Milligan Mason Award by the American Association For The Advancement Of Science (AAAS). Ferry was awarded for her extraordinary contribution in her research program and her commitment to move the field forward. 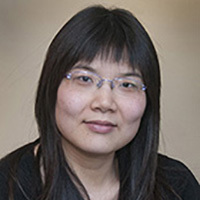 Her research focuses on light-matter interactions in nanoscale materials, and her specific research interests include light management in solar energy conversion, switchable metamaterials, and nanoscale chirality. October, 2018: Professor Theresa Reineke (MRSEC IRG-3 Chem) has received the 2018 DuPont Nutrition & Health Science Excellence Medal from the Danisco Foundation for her achievements in advancing science and technology relevant to the future of food, nutrition, and health. 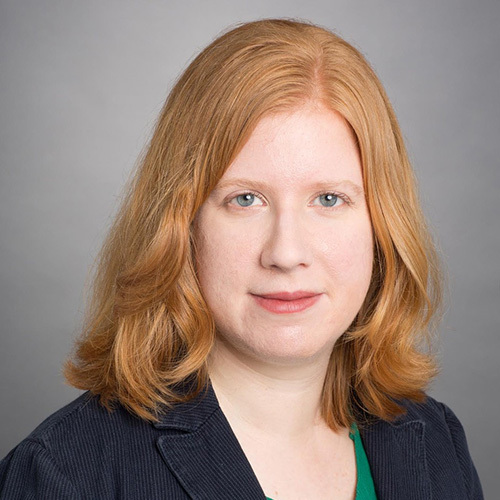 October 24, 2018: Assistant Professor Vivian Ferry (MRSEC Seed CEMS) has been awarded the 2018 Stanford R. Ovshinsky Sustainable Energy Fellowship by the American Physical Society (APS), for her research on developing improved photovoltaic systems using spectrally-selective photonic structures. 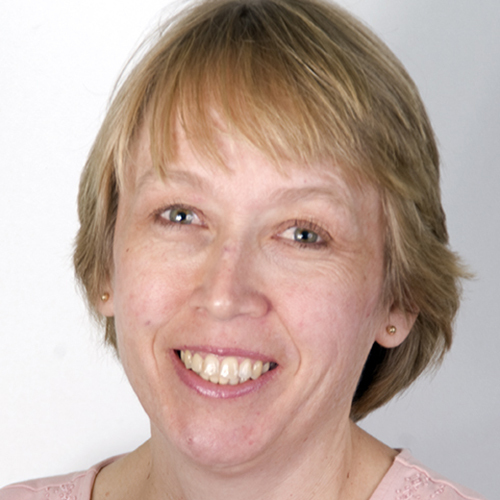 October, 2018: Professor Theresa Reineke (MRSEC IRG-3 Chem) is featured in Bioconjugate Chemistry's "Women in Bioconjugate Chemistry: Celebrating Women Scientists" virtual issue. This issue celebrates women in science. 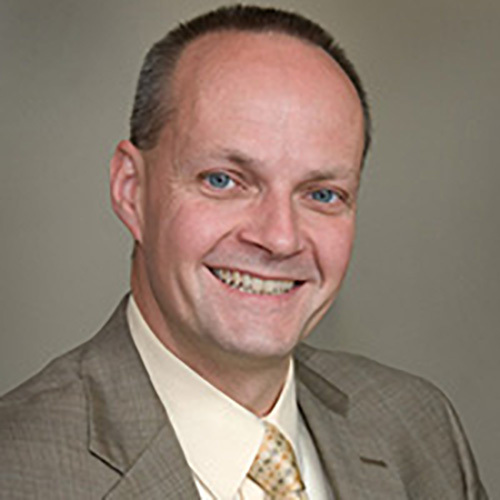 Professor Uwe Kortshagen has been elected as a Fellow of the American Physical Society (APS). September, 2018: Professor Uwe Kortshagen (MRSEC IRG-2 Mechanical Engineering), is being honored "for contributions to our fundamental understanding of non-linear electron transport and plasma-nanoparticle interactions in low temperature plasmas and the development of plasma based synthesis of nanoparticles." The number of APS Fellows elected each year is limited to no more than 1/2 of 1% of the membership! Congratulations! 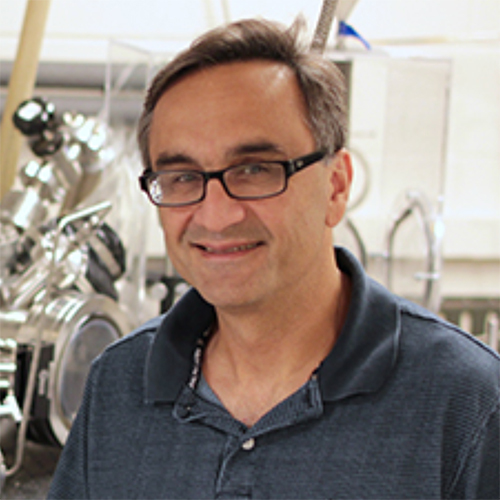 September 12, 2018: Professor Boris Shklovskii (MRSEC IRG-2 Physics), has been awarded the 2019 Oliver E. Buckley Condensed Matter Prize. 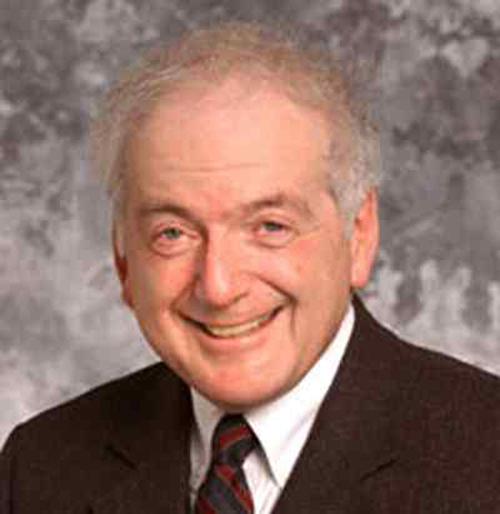 The APS Buckley Condensed Matter Award recognizes his "pioneering research in the physics of disordered materials and hopping conductivity." Congratulations! July 18, 2018: MRSEC PhD students Jacob Held (IRG-2),Biqiong Yu (IRG-1), and Tao Zhang (iSuperSeed) are among the 2018-2019 Doctoral Dissertation Fellows. The Doctoral Dissertation Fellowship (DDF) gives the University's most accomplished PhD candidates an opportunity to devote full-time effort to an outstanding research project by providing time to finalize and write a dissertation during the fellowship year. Congratulations! 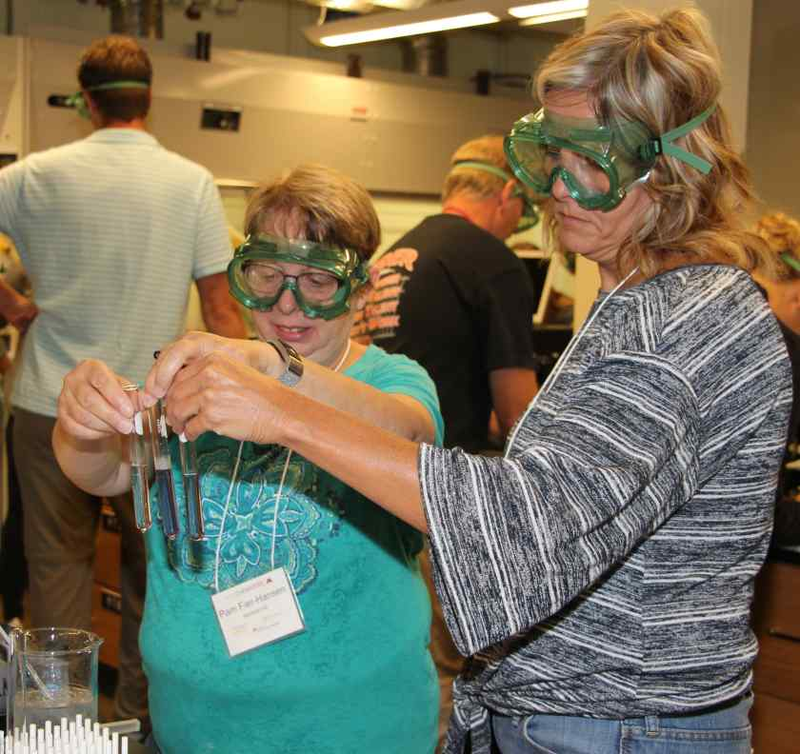 July 17, 2018: Professor Jane Wissinger hosted a workshop for high school science teachers focused on green and sustainable chemistry curriculum for their classrooms. Twenty-one teachers from across the state of Minnesota (as far as Morris and Moose Lake as well as local) participated in the multi-day workshop, July 17-19. In both classroom and laboratory learning experiences, the teachers learned about the principles of green chemistry, sustainability goals, and their application in addressing human health and the environment. The Center for Sustainable Polymers (CSP), in partnership with the Minnesota Corn Growers Association and the University’s Materials Research Science & Engineering Center (MRSEC) offered this free workshop. Wissinger is a CSP investigator and is a leading expert in green chemistry. Her co-hosts were Cassandra Knutson from White Bear Lake High School, and Cassidy Javner from Shakopee High School. Both Knutson and Javner are associated with the Materials Research Science and Engineering Center's (MRSEC) Research Experiences for Teachers (RET) program. 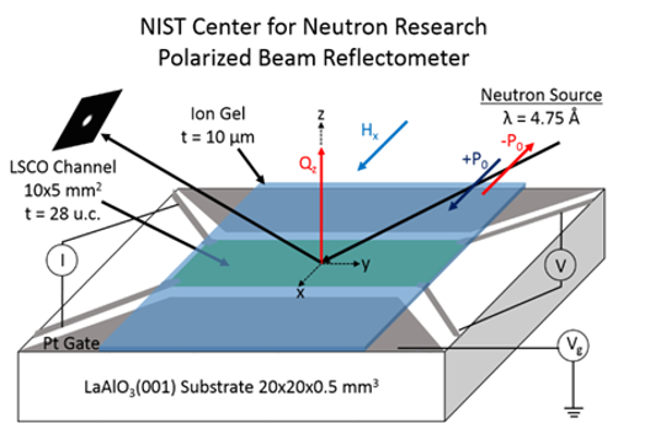 July, 8, 2018: Recent work at the University of Minnesota, supported by the UMN MRSEC, The National Institute of Standards and Technology, and Argonne National Lab has combined X-ray and neutron scattering to probe elusive operating mechanisms in a new class of devices known as electrolyte transistors. June 17, 2018: Assistant Professor David J. Flannigan (Seed) has been selected to receive the Sigma Xi 2018 Young Investigator Award for his outstanding contributions as a researcher in the early stage of his career and exemplifying the ideals of Sigma Xi, the Scientific Research Honor Society. The award includes an honorarium of $5,000, a commemorative certificate, and the opportunity to present the Young Investigator Award Lecture at the Society’s Annual Meeting on October 25-28, 2018 in San Francisco, California. June 8, 2018: Spencer Reisbick (Seed) has received a Microscopy & Microanalysis (M&M) Student Scholar Award. 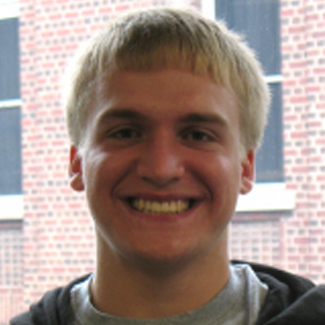 He is a third-year chemical physics graduate student who is advised by David Flannigan from the Department of Chemical Engineering and Materials Science. Under Flannigan's tutelage, Spencer works on the structural localization of charge density waves in 1T-TaS2. Papers from more than 175 applicants were reviewed, from which only 30 were selected for M&M Student Scholar Awards. The award is sponsored by the Microanalysis Society and includes complimentary registration for the full M&M 2018 meeting and financial support of $1,000 to help defray costs of attending the meeting held in Baltimore, in August 2018. Spencer is the laboratory safety officer for Flannigan's research group, and is Education and Resources Chair for the Joint Safety Team. 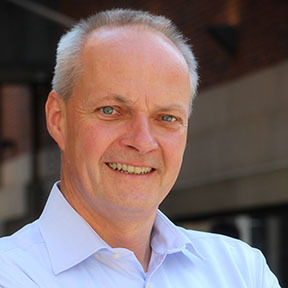 May 15, 2018: Professor Martin Greven (IRG-1) has been named a 2018 fellow of the Neutron Scattering Society of America (NSSA). 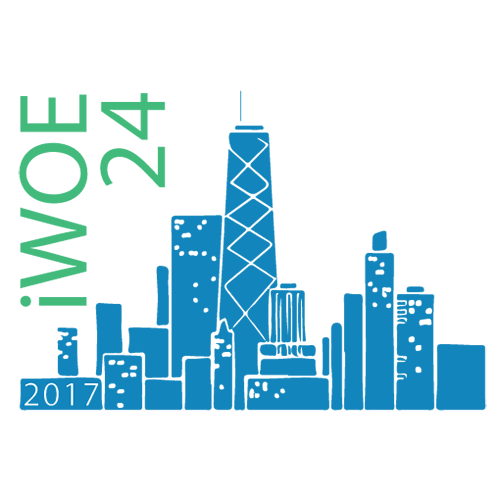 The Fellowship recognizes members who have made significant contributions to the neutron scattering community in North America. 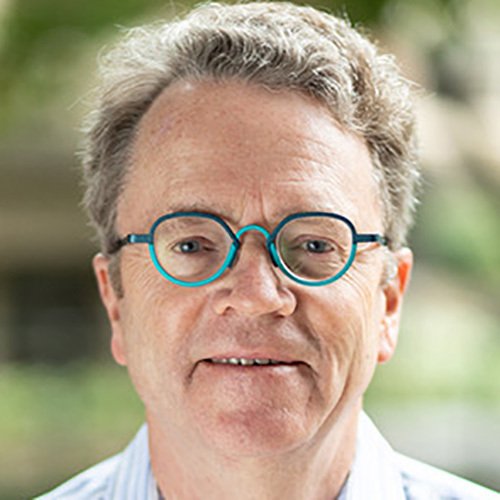 Greven was cited for "world-class efforts in the growth and neutron scattering study of bulk oxides, especially for his influential work on cuprate high-Tc superconductors." May 8, 2018: Professor Christy L. Haynes (IRG-2) has received the 2018 Theophilus Redwood Award from the Royal Society of Chemistry. This award honors leading analytical scientists who are outstanding communicators. Haynes is the first female chemist to receive this award. 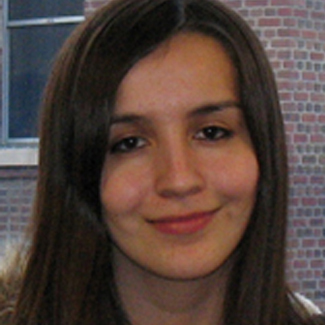 Her research group focuses on applications of analytical chemistry in the fields of immunology and toxicology, with much expertise in the area of single cell analysis. Another major focus encompasses studying fundamental properties of cells involved in inflammation. Her group has performed the first ever real-time single blood platelet measurements, examining the chemical messenger molecules that platelets secrete upon stimulation. 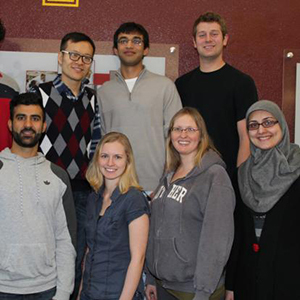 While most of the Haynes lab research employs electrochemical and spectroscopic techniques, the group is always exploring new and exciting technologies to answer pressing bioanalytical questions. May 4, 2018: Regents Professor Frank S. Bates (IRG-3) was inducted into the prestigious National Academy of Sciences (NAS) during the National Academy of Sciences 155th Annual Meeting in Washington, D.C. on Saturday, April 28, 2018. Bates was among only 84 researchers nationwide to be elected to the National Academy of Sciences in 2017. April 27, 2018: A research team led by Professor Bharat Jalan (IRG-1, Seed), including CEMS graduate students Abhinav Prakash and Tianqi Wang (Seed), has been recognized as a 2018 TechConnect Innovation Awardee for their technology, “Transparent Conducting Oxide Film – Indium Tin Oxide Alternative." The group will be honored at the TechConnect World Conference in Anaheim, California in May 2018. The TechConnect Innovation Awards selects the top early-stage innovations from around the world through an industry-review process of the top 20% of annually submitted technologies into the TechConnect World Conference. Rankings are based on the potential positive impact the submitted technology will have on a specific industry sector. April 8, 2018: Professor Laura Gagliardi (iSuperSeed) has been honored with a prestigious Humboldt Research Award from the Alexander von Humboldt Foundation, which will enable her to conduct research with scientists in Germany in 2019. The award is named after the late Prussian naturalist and explorer Alexander von Humboldt. Every year, the Alexander von Humboldt Foundation enables researchers from all over the world to spend time conducting research in Germany. Gagliardi is one of the most highly accomplished theoretical and computational chemists in the world, internationally known for her contributions to the development of electronic structure methods and their use for understanding complex chemical system. 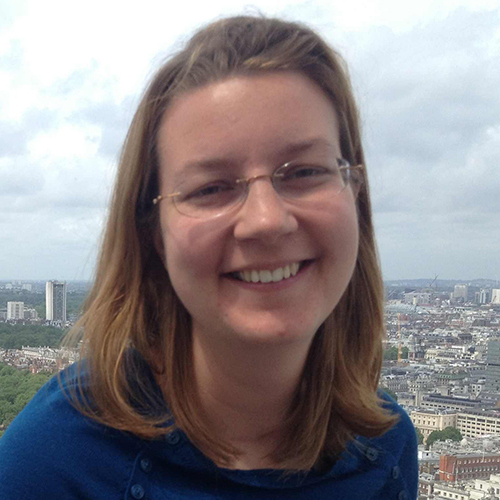 Her work involves the prediction and modeling of chemical phenomena by means of advanced chemical computation. April 5, 2018: Chemistry Professor Christy L. Haynes (IRG-2) has been awarded a 2018 Guggenheim Fellowship. Appointed on the basis of prior achievement and exceptional promise, the highly competitive, national fellowship is awarded annually to about 175 scholars and artists selected from nearly 3,000 applicants. 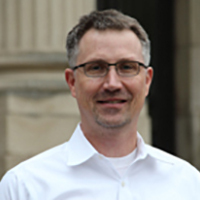 Professor Haynes is associate department head of the Department of Chemistry and the Elmore H. Northey Professor of Chemistry, and an associate editor of Analytical Chemistry. 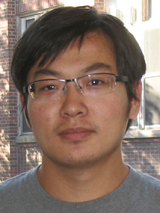 March 31, 2018: Assistant Professor Xiaojia Wang (IRG-2, Seed) has been selected for the 2018 3M Non-Tenured Faculty Award. This award is administered by 3M Research and Development in partnership with the Corporate Giving Program. It recognizes outstanding junior faculty and encourages the pursuit of new ideas among non-tenured professors, giving them the opportunity to interact with their peers and 3M scientists. 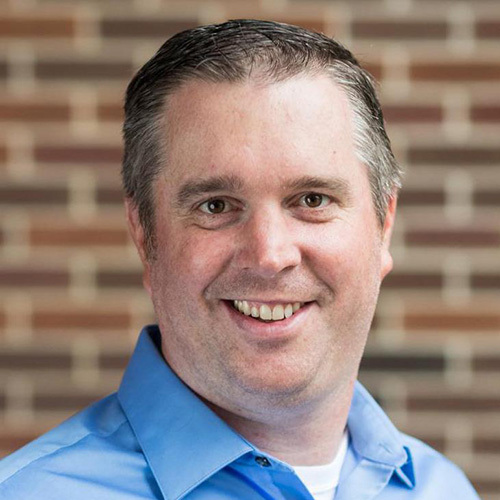 March 20, 2018: David Flannigan (Seed) has been selected as one of five recipients of the University of Minnesota's special mid-career faculty award, the McKnight Presidential Fellow Award. 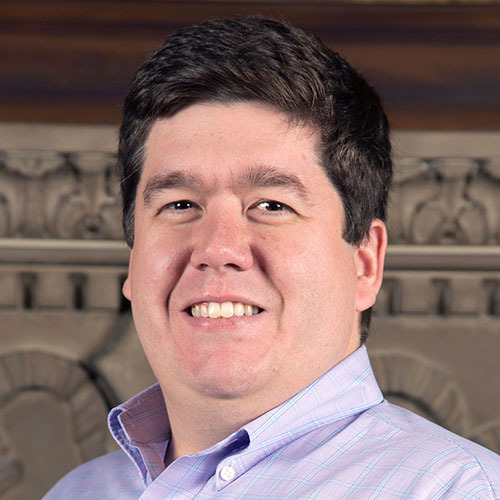 As an award recipient, Flannigan will hold the title of McKnight Presidential Fellow for three years and receive funding to support his research and scholarly activities. February 22, 2018: Professor Theresa Reineke (IRG-3) has been honored as a 2018 POLY Fellow by the American Chemical Society Division of Polymer Chemistry, recognized for her scientific accomplishments and service to the profession. She will be honored at the POLY/PMSE Awards Ceremony, 5:30 p.m. Wednesday, March 21, at the ACS Spring National Meeting in New Orleans. Reineke is internationally recognized for her transformative research contributions to the field of polymeric materials chemistry; leadership of innovative and collaborative research teams across the University of Minnesota campus; excellent track record of entrepreneurship and technology licensing; and service to societies and organizations in her research field. February 14, 2018: The development of a new additive that helps meld incompatible types of plastic together, which holds important implications for recycling, has won the 2017 Newcomb Cleveland Prize of the American Association for the Advancement of Science. The Association's oldest prize, supported by The Fodor Family Trust, annually recognizes the author(s) of an outstanding paper published in the Research Articles or Reports sections of the journal Science between June and the following May. Due to their remarkable work, James Eagan and his colleagues at Cornell University, with contributions from Regents Professor Frank Bates (IRG-3), Professor Emeritus Chris Macosko, and CEMS graduate student Jun Xu, will receive the 2017 Newcomb Cleveland Prize. The research was originally published by Science on Feb. 24, 2017. 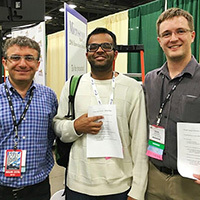 The full list of researchers who contributed to the award-winning work and related Science paper "Combining polyethylene and polypropylene: Enhanced performance with PE/iPP multiblock polymers" include: James M. Eagan, Jun Xu, Rocco Di Girolamo, Christopher M. Thurber (Ph.D. ChE '15), Christopher W. Macosko, Anne M. LaPointe, Frank S. Bates, and Geoffrey W. Coates. January 23, 2018: MRSEC Seed Investigator David Flannigan has been selected by the College of Science and Engineering (CSE) Promotion and Tenure Advisory Committee to receive the George Taylor Career Development Award. 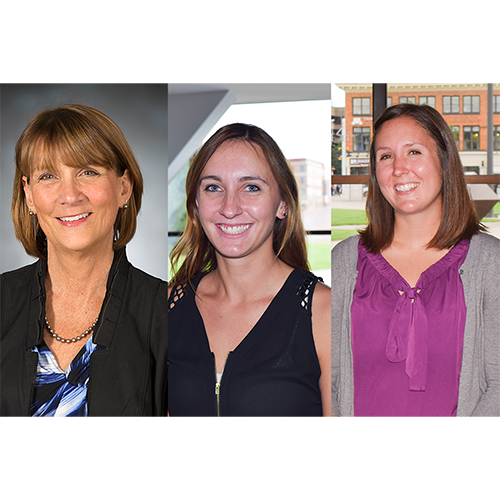 January 3, 2018: MRSEC RET participants Cassandra Knutson and Cassidy Javner, along with their faculty mentor Jane Wissinger of the UMN Center for Sustainable Polymers, have been selected as recipients of an ACS-CEI Award for Incorporating Sustainability into Chemistry Education, sponsored by the ACS Committee on Environmental Improvement (CEI). This award is an acknowledgement of the team's efforts to incorporate sustainability into the high school chemistry classroom through development of an annual three-day summer workshop for Minnesota high school chemistry teachers. The workshop includes a background and introduction to sustainability and green chemistry along with hands-on laboratory experiments that highlighted novel polymer experiments aligned with next generation science standards (NGSS). The 2017 workshop (June 20-22) was attended by 20 teachers. The award will be presented at the 2018 ACS Spring Meeting in New Orleans (March 18-22) where Knutson, Javner, and Wissinger will present their work. This workshop is sponsored by the University of Minnesota Materials Research Science and Engineering Center, the Minnesota Corn Growers Association, and the Center for Sustainable Polymers. November 17, 2017: MRSEC researcher Jeff Walter (with research partner Bryan Voigt) was named a finalist in the Dow Sustainability Innovation Student Challenge Award (SISCA) competition for their project titled, Pyrite FeS2: A Low-Cost Earth-Abundant Solar Solution for Sustainable Power. 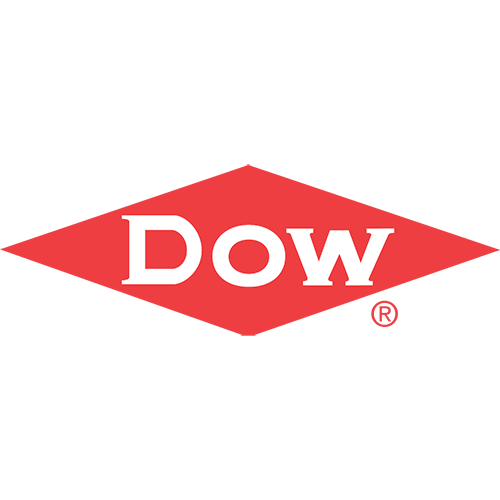 The Dow Sustainability Innovation Student Challenge Award (Dow SISCA) recognizes the work of graduate students with innovative ideas and research that encourages and promotes sustainable solutions to the world’s most pressing environmental problems. Update: Walter named runner-up in final round and received a $2,500 prize. November 14, 2017: Investigator Chris Leighton spoke as a Distinguised Lecturer at the Rochester Institute of Technology in Rochester, New York on his MRSEC and Center for Qunatum Materials (CQM) funded work. November 14, 2017: Investigator Christy Haynes has been named an Institute on the Environment (IonE) Fellow for her distinguished intellectual contributions to creating a sustainable futures. 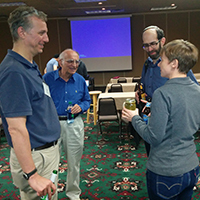 Other MRSEC IonE fellows (named in previous years) include Eray Aydil, Laura Gagliardi, and Marc Hillmyer. October 26, 2017: Investigator Cari Dutcher was awarded the 2017 Kenneth T. Whitby Award from the American Association for Aersol Research. This award recognizes Dutcher for her outstanding technical contributions to aerosol science and technology as a young scientist. 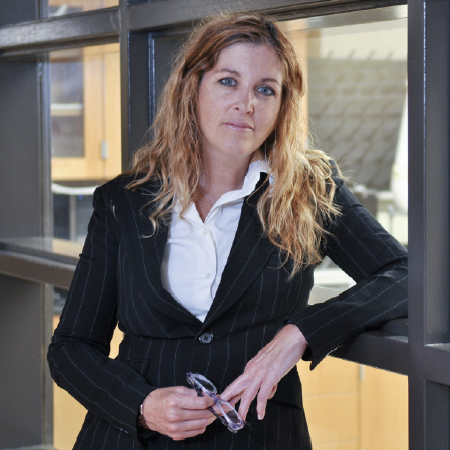 October 26, 2017: Investigator Christy Haynes is featured in The Analytical Scientist's 2017 Power List as one of the top 10 researchers in the category Giants of Nano: Microfluidics and nanoscale science. October 5, 2017: Regents Professor Timothy Lodge has received the 2018 Paul J. Flory Polymer Education Award from the American Chemical Society (ACS) Division of Polymer Chemistry, honored for his outstanding achievements in promoting undergraduate and graduate polymer education. October 2, 2017: MRSEC researcher Dr. Laxman R. Thoutman received a runner-up award at the poster competition at the International Workshop on Oxide Electronics (IWOE 24). 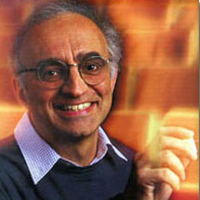 His work was titled, "The Role of Point Defects and Band Offsets on Quasi-2DEG at Complex Oxide Heterostructures". September 15, 2017: Researcher Zachary Robinson (Kortshagen group) was one of only 52 students nationwide to receive the Department of Energy's 2017 Office of Science Graduate Student Research Program Award. Robinson will be conducting research in ultrafast materials and chemical sciences at the Los Alamos National Laboratory (LANL) in New Mexico for DOE’s Basic Energy Sciences program. Physics Force and Energy and U featured on TPT/PBS "Hands on Science"
September 11, 2017: The TPT/PBS pilot season of "Hands on Science" will feature Physics Force and Energy and U. 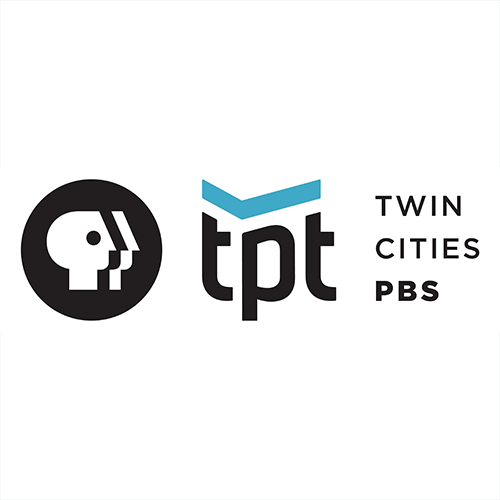 The episodes will appear on the TPT/PBS website and via Roku, Apple TV, and other streaming devices. Each episode will play on TPT 2 shortly after the premiere date. September 11, 2017: Investigator Bharat Jalan is the 2017 winner of the Paul H. Holloway Young Investigator Award from the Thin Film Division of the American Vacuum Society. Read more about Jalan's Award. September 1, 2017: The CEMS Fall 2017 Department Seminars series begins September 5. All seminars will be held in B-75 Amundson Hall from 1:25–2:20 pm. MRSEC investigator, David Flannigan, will be the series kick-off speaker. August 30, 2017: Prof. Karen Wooley from Texas A&M University will be giving a seminar hosted by the POLY PMSE student chapter, "Functional polymer materials designed for advanced applications and sustainability". It will take place on Tuesday, September 12th at 9:45 AM in Smith 331. 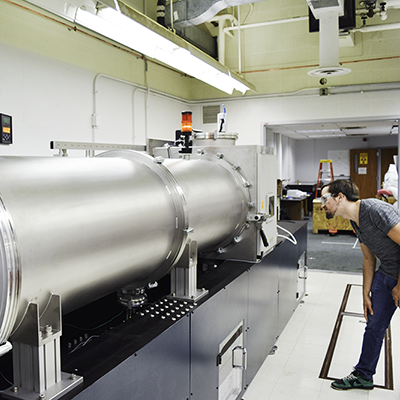 August 28, 2017: The UMN Characterization Facility, a College of Science & Engineering core facility, recently acquired a state-of-the-art small-angle X-ray scattering (SAXS) instrument through generous contributions from the NSF-funded UMN Materials Research Science & Engineering Center and the UMN Center for Sustainable Polymers, the Industrial Partnership for Research in Interfacial and Materials Engineering (IPRIME), and the Office of the Dean of the College of Science & Engineering. Read more about the SAXS equipment. August 25, 2017: Former MRSEC student Nazila Haratipour has been invited to attend the Rising Stars 2017 workshop at Stanford University. Rising Stars is a career-building workshop for women electrical and computer engineers and computer scientists interested in careers in academia. The workshop brings together the best and brightest graduate and postdoc women in EE and CS for scientific discussions and informal sessions aimed at navigating the early stages of an academic career. 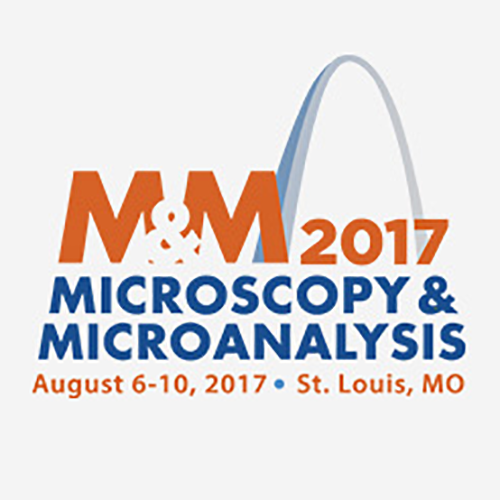 August 16, 2017: MRSEC investigator Uwe Kortshagen of IRG-2 serves as a Technical Advisor for a new start-up, Ensor, Inc.
August 15, 2017: MRSEC researcher Jacob Held (Mkhoyan Group) won a first place MSA Student Poster Award at the Microscopy & Microanalysis 2017 meeting for his poster, "Elemental Distribution Analysis of Core/Shell Nanocrystals with STEM/EDX." Read more about the award from the CEMS news coverage. 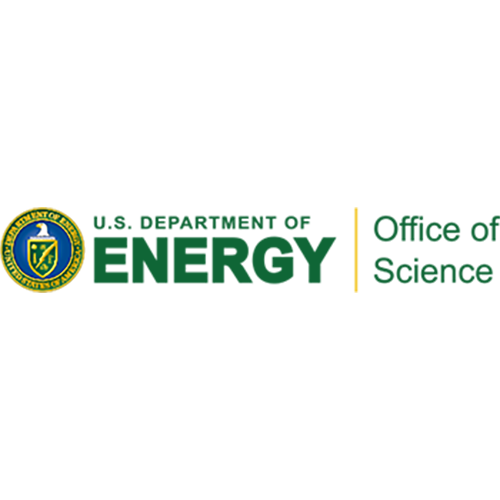 August 10, 2017: MRSEC seed investigator David Flannigan was selected to receive a financial award as part of the 2017 Department of Energy (DOE) Early Career Research Program. 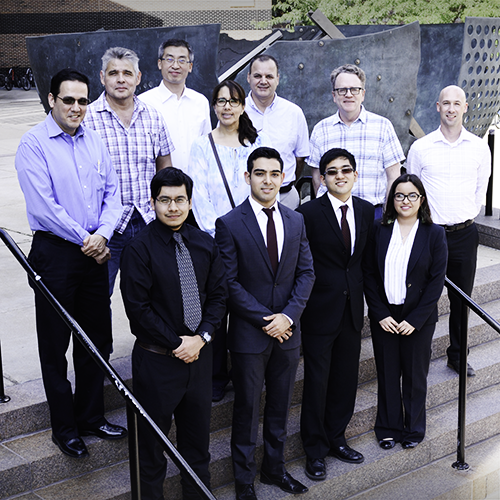 August 3, 2017: The University of Minnesota MRSEC welcomes University of Texas Rio Grande Valley (UTRGV) colleagues for two days (August 8 & 9) to discuss collaborative efforts in both The Partnership for Research and Education in Materials (PREM) program and other MRSEC-based collaborations. Read more about the UTRGV and UMN MRSEC PREM visit. 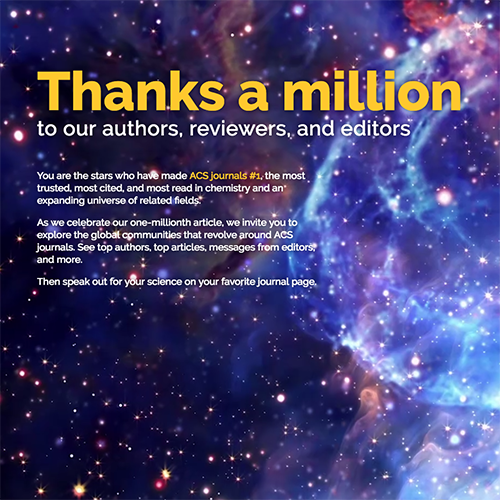 July 25, 2017: MRSEC investigators Theresa Reineke, Marc Hillmyer, and Tim Lodge were named by ACS in a list of highly prolific authors published as part of the celebration of ACS's one-millionth article publication. 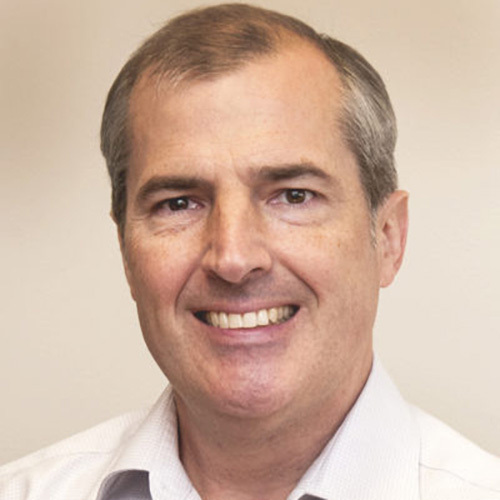 As Editor-in-chief of the journal, Macromolecules, Director Tim Lodge is featured on the ACS Macromolecules page. June 16, 2017: MRSEC member David Blank has been appointed the new Head of the Department of Chemistry, effective Sept. 1, 2017. The appointment was made by Samual B. Mukasa, Dean of the College of Science & Engineering. Blank succeeds Professor William Tolman who has served as the department’s chair for the past eight years. 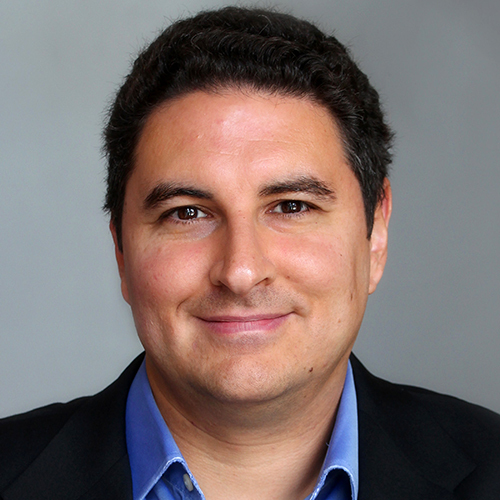 Read more about David Blank's appointment as Department Head. June 15, 2017: MRSEC Investigator Bharat Jalan is awarded the American Association for Crystal Growth Young Scientist Award for his scientific excellence, clarity of presentation and impact on the field of crystal growth. Read more about Bharat Jalan's Award. June 15, 2017: 2017 IPRIME poster awards were awarded to MRSEC researchers Sunipa Pramanik (Nanostructural Materials and Processes) and Tianqi Wang (Electronic Materials and Devices). Read more about the CEMS students who received IPRIME awards. June 5, 2017: MRSEC Investigator Christy Haynes is a National Finalist for the 2017 Blavatnik National Awards for Young Scientists. May 26, 2017: MRSEC Investigator Rafael Fernandes has been named a McKnight Presidential Fellow. 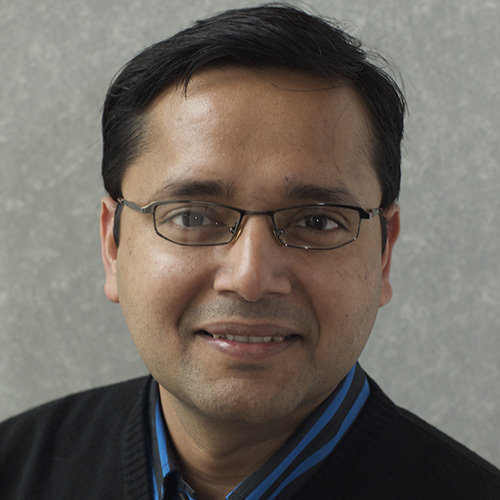 May 10, 2017: MRSEC Investigator Bharat Jalan is featured in a news release from the University of Minnesota College of Science and Engineering titled, "Discovery of new transparent thin film material could improve electronics and solar cells." May 10, 2017: MRSEC Seed Investigator Vlad Pribiag was awarded 1 of 2 International Union of Pure and Applied Physics (IUPAP) Young Scientist Prize in Low Temperature Physics for “important contributions to two main areas of low temperature and nanoscale physics: superconductivity in the edge modes of two-dimensional topological insulators; spin-dependent quantum transport in one-dimensional semiconductors with strong spin-orbit coupling. His results have elucidated key aspects of the electronic properties of these novel materials, which are candidates for quantum and classical information processing”. May 2, 2017: MRSEC Investigator Frank Bates was elected to the National Academy of Sciences for his excellence in original scientific research. Read the full article from the College of Science and Engineering. April 3, 2017: MRSEC Investigator Chris Leighton has recently been appointed as inaugural Editor of the newest addition to the American Physical Society family of journals, Physical Review Materials. Read the full article from the Department of Chemical Engineering and Materials Science. 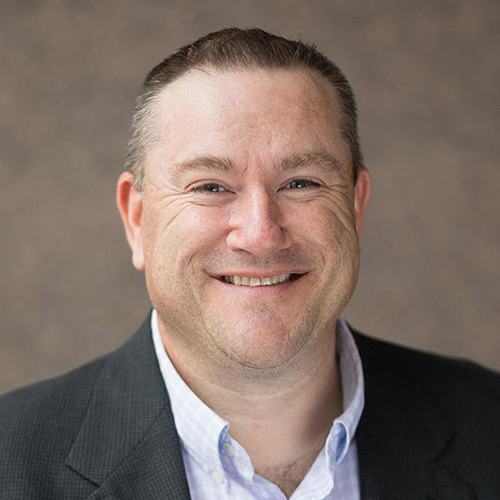 March 29, 2017: MRSEC Investigator Marc Hillmyer was recognized by the University of Minnesota as one of four researchers awarded the Entrepreneurial Resaerch Award for his work in developing environment-friendly materials from renewable sources. Read the full article from the University of Minnesota College of Science and Engineering. 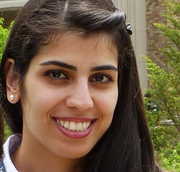 March 24, 2017: MRSEC Researcher Athena Metaxas was awarded a National Science Foundation Graduate Research Fellowship. Read more about the CEMS students who received NSF Graduate Research Fellowships. March 16, 2017: MRSEC Investigator Radael Fernandes was awarded the 2017 George W. Taylor Career Development Award. Read more about the George W. Taylor awards and awardees. March 15, 2017: MRSEC Investigator Beth Stadler is a recipient of the 2017 Taylor Award for Distinguished Service. Read the full article from the Department of Electrical and Computer Engineering. March 10, 2017: MRSEC Investigator Theresa Reineke was awarded the 2017 Distinguished McKnight University Professorship, an award given to outstanding mid-career faculty. 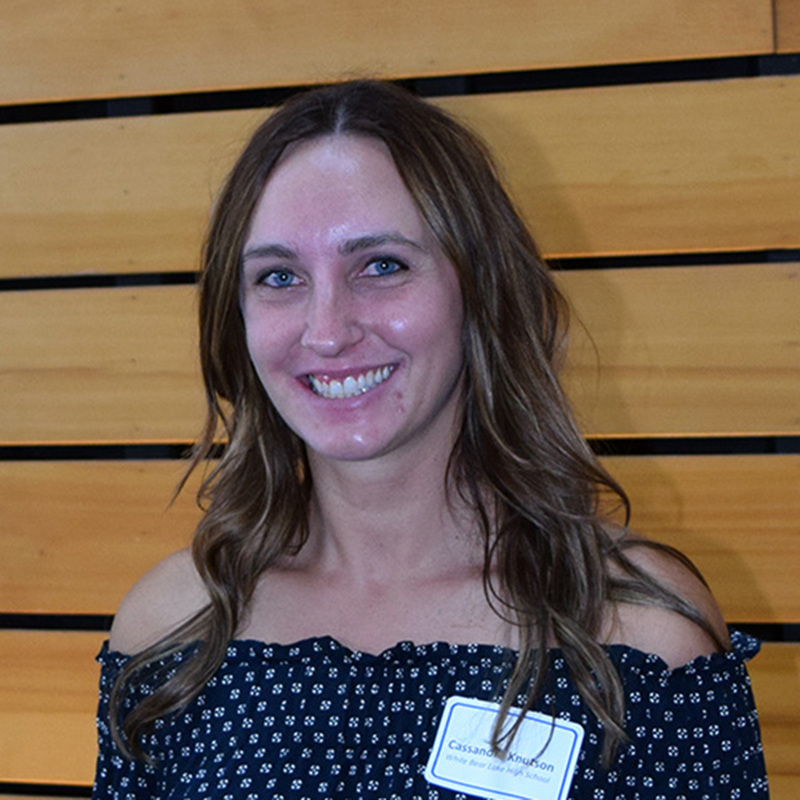 March 9, 2017: MRSEC Investigator Eray Aydil was awarded the University of Minnesota Award for Outstanding Contributions to Postbaccalaureate, Graduate, and Professional Education. This annual award recognizes faculty nominated by the colleges for excellence in education. Read more about the Award for Outstanding Contributions to Postbaccalaureate, Graduate, and Professional Education 2017 awardees. February 23, 2017: MRSEC Seed Investigator Vlad Pribiag was selected as one of the 2017 Alfred P. Sloan Research Fellow in Physics for his work on electronic transport in low-dimensional materials. February 20, 2017: MRSEC Investigator Uwe Kortshagen's group work was published in Nature Photonics with press coverage by the University of Minnesota. Read the University of Minnesota article titled, "Dream of energy-collecting windows is one step closer to reality"
February 6, 2017: MRSEC Investigator Cari Dutcher received the University of Minnesota McKnight Land-grant Professorship for her work on "Understanding Atmospheric Aerosol Particles through Models, Mimics, and Microfluidics." Read more about the McKnight Land-grant Professorship award and 2017 awardees. February 6, 2017: MRSEC Investigator Vivian Ferry received the University of Minnesota McKnight Land-grant Professorship for her work on "Creating New Optical Materials for Application in Photovoltaics and Optoelectronic Devices." January 18, 2017: MRSEC hosted its Inaugural Seed Sypmosium. Read the more about the event. January 13, 2017: MRSEC seed investigator, Michael McAlpine, was one of 102 scientists awarded the Presidential Early Career Award for Scientists and Engineers (PECASE) by President Obama. This award is the highest honor bestowed by the United States Government for early career scientists and engieers. Read the full article from the White House Office of the Press Secretary. 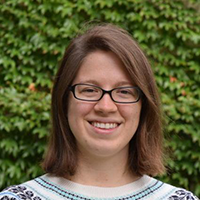 January 3, 2017: MRSEC seed investigator, Laura Gagliardi, received the Isaiah Shavitt Lectureship. December 7, 2016: MRSEC researcher, Dayne Plemmons (Flannigan group) won the "Best Poster Award" at the 2016 Materials Research Society (MRS) Fall Meeting & Exhibit in Boston, Massachusetts. 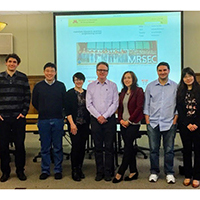 November 30, 2016: On October 23 – 27, 2016, the University of Minnesota MRSEC provided travel support for a team of Materials Science and Engineering (MSE) undergraduate students to attend the the Materials Science & Technology 2016 meeting (MS&T16) in Salt Lake City, Utah. The team of students from the University of Minnesota won 3rd place in the Ceramic Mug Drop competition. Read more about Minnesota team and the competition. November 29, 2016: CEMS features a piece on the Community of Chemistry Graduate students, a group dedicated to improving mental, physical, and social health of graduate students. MRSEC reseacher, Amanda Maxwell, is a member of the CCGS team. Read the full feature from the Department of Chemical Engineering and Materials Science. 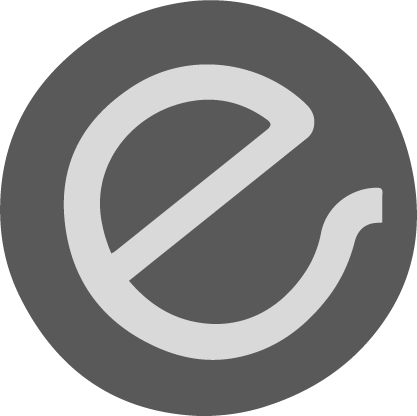 November 28, 2016: MRSEC investigator, Eray Aydil, is deatured on Nanovation. November 28, 2016: MRSEC investigator, Steven Koester, has been named an Institute of Electrical and Electronics Engineers (IEEE) Fellow. 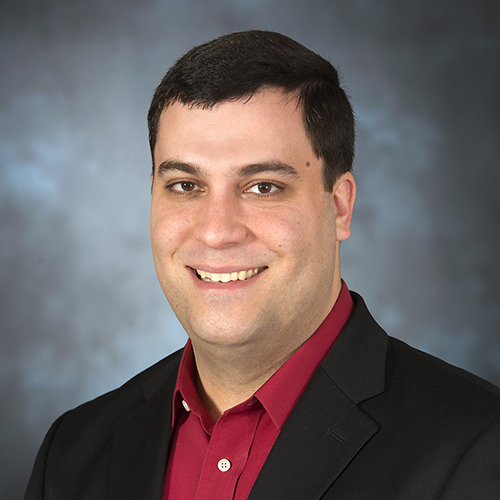 November 17, 2016: MRSEC investigator, David Flannigan, was awarded the Faculty Early Career Development (CAREER) award from the National Science Foundation for his work on "Defect-modulated energy transport in semiconducting materials". November 10, 2016: MRSEC Researcher, Nancy Trejo (Aydil group), won the Arvind Varma Graduate Travel Award to support her travel to the upcoming AIChE annual meeting in San Francisco, CA. October 25, 2016: Investigator Frank Bates gave the H.C. Ørsted Lecture at Technical University of Denmark on October 13. His lecture was titled, "Sphericity and Symmetry Breaking in the Formation of Quasicrystals and Frank Kasper Phases in Block Polymer Melts." Read the full article and see the video from the Department of Chemical Engineering and Materials Science. 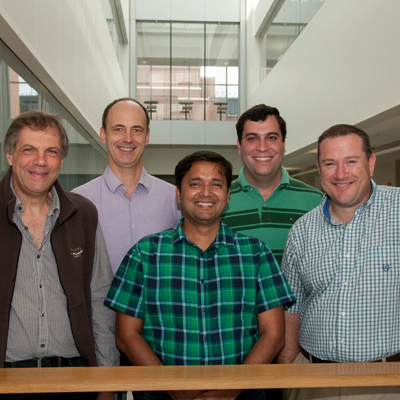 October 20, 2016: A team of researchers, including MRSEC Investigators Rafael Fernandes, Martin Greven, Bharat Jalan, and Chris Leighton were awarded $2.6 million over the next 3 years from the Department of Energy Office of Basic Energy Sciences to start the Center for Quantum Materials. October 19, 2016: Investigator Christy Haynes is featured in The Analytical Scientist's 2016 Power List as one of the top 50 women in analytical science. October 17, 2016: MRSEC Researcher, Nancy Trejo (Aydil group), won the Minnesota AVS Fall Symposium best poster award for research on the syntehsis, morphology, structure, and optical properties of SnS Nanoplates. October 11, 2016: MRSEC Researcher, Karl Schliep (Flannigan group), is one of seven scientists chosen for the National Institute of Standards and Technology (NIST) National Research Council (NRC) Postdoctoral Research Associate Program. 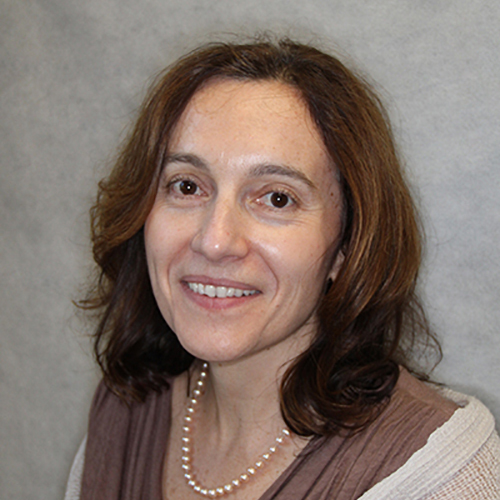 October 11, 2016: Seed Investigator Laura Gagliardi "has been elected a Fellow of the American Physical Society, honored for her seminal contributions to the development of electronic-structure methods and their application to the understanding of complex chemical systems, including the prediction of new materials and associated properties." Read the rest of the article from the Department of Chemistry. QMED: Is This 3D Printing’s Future? September 21, 2016: Seed Investigator Mo Li received the Institute for Engineering in Medicine Faculty Development Award for his research on developing a wearable spectroscopic sensin system for physiological monitoring. September 16, 2016: Investigator Bharat Jalan received his 2016 Young Investigator MBE Award at the 19th International Conference on Molecular Bean Epitaxy in Montpellier, France. September 13, 2016: Investigator Lorraine Francis was named the 3M Chair in Experiential Learning by the University of Minnesota College of Science and Engineering. September 7-10, 2016: Investigators Chris Leighton and Dan Frisbie were local organizers for the FET2016 workshop — an international outreach event where attendees heard from 20 invited speakers from across the US, Europe, and Asia on the latest advances in field-effect control of materials. Read more about FET2016. August 23, 2016: Investigator Vivian Ferry was named to the MIT Technology Review 2016 Innovators Under 35 list. Look for Ferry in the September/October print magazine! August 22, 2016: Mkhoyan group member, Jacob Held, was awarded a student poster award at the Microscopy & Microanalysis 2016 meeting. August 22, 2016: Seed investigator Xiang Cheng received a Defense Advanced Research Projects Agency (DARPA) Young Faculty Award for his reseach on "Studying the emergent collective flows of active fluids using engineered bacterial strains." August 18, 2016: Director Tim Lodge and investigator Marc Hillmyer were quoted in a Nature news feature on polymer science titled, "The plastics revolution: how chemists are pushing polymers to new limits." July 24, 2016: Seed Investigator Laura Gagliardi has been named associate editor for the Journal of Chemical Theory and Computation for her expertise in quantum mechanics, inogranic, nanoscience, and materials science. May 26, 2016: Professor David Flannigan's group research published in the article, "Discrete Chromatic Aberrations Arising from Photoinduced Electron-Photon Interactions in Ultrafast Electron Microscopy" was featured on the cover of J. Phys. Chem. A. Professor David Blank has been awarded the 2016 President's Award for Outstanding Service. In announcing the award, University of Minnesota President Eric Kaler wrote, “Your excellence is a model for your colleagues and co-workers to emulate. True to the mission of this great land-grant institution, you have done more than your share to make the University of Minnesota one of the preeminent institutions in the nation." Read the full article from the University of Minnesota Department of Chemistry. Theresa Reineke was awarded the 2016 George W. Taylor Award for Distinguished Research from the University of Minnesota College of Science & Engineering. 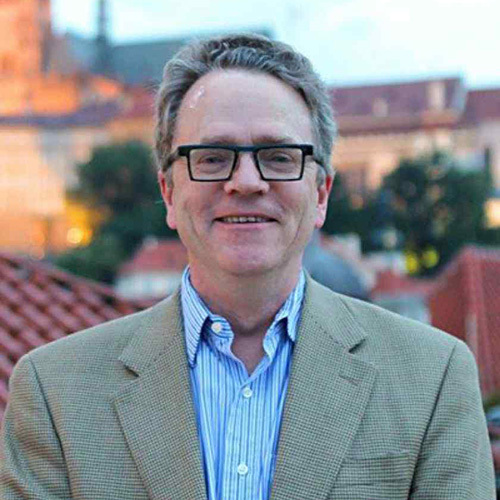 Tim Lodge, MRSEC Director, was elected to the American Academy of Arts and Sciences. "Founded in 1780, the American Academy of Arts and Sciences is one of the country’s oldest learned societies and independent policy research centers, convening leaders from the academic, business, and government sectors to respond to the challenges facing the nation and the world. Current Academy research focuses on higher education, the humanities, and the arts; science and technology policy; global security and energy; and American institutions and the public good. The Academy’s work is advanced by its elected members, who are leaders in the academic disciplines, the arts, business, and public affairs from around the world.” -AAAS. Read the press release from the American Academy of Arts and Sciences. Flannigan group research, titled Femtosecond electron imaging of defect-modulated phonon dynamics, was published in Nature Communications. 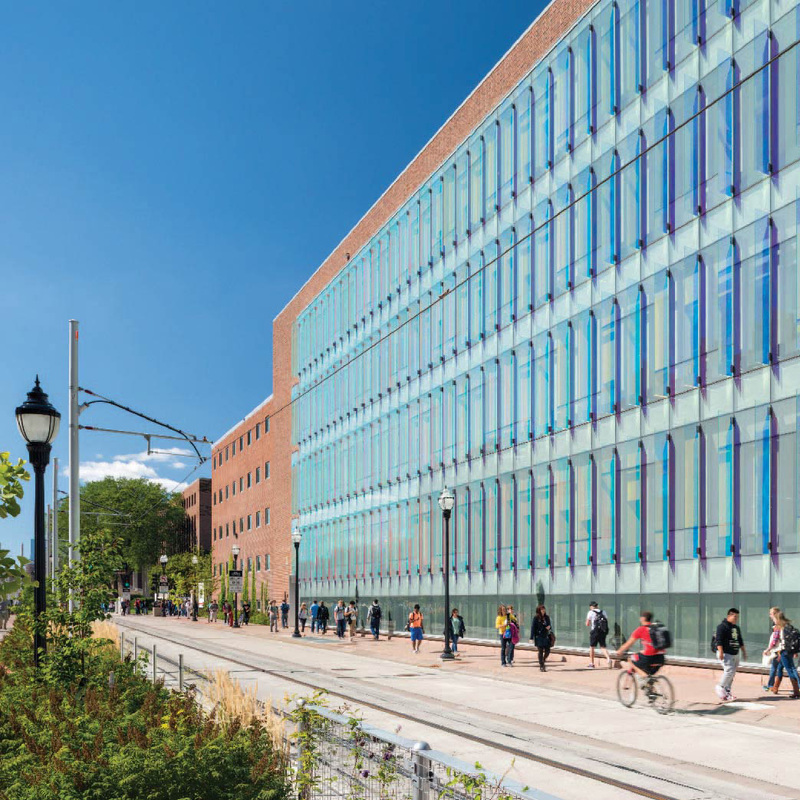 Read the press release from the University of Minnesota College of Science and Engineering. 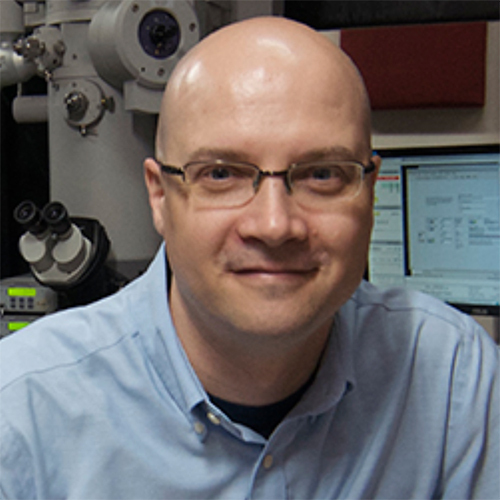 Tim Lodge (director) is named a 2016 Neutron Scattering Society of America (NSSA) Fellow “for the creative use of SANS to achieve groundbreaking insights into the structure and dynamics of a wide range of complex polymer systems, in particular, multi-block copolymers in the bulk and in selective solvents” —NSAA. Read the full article from the Department of Chemistry. 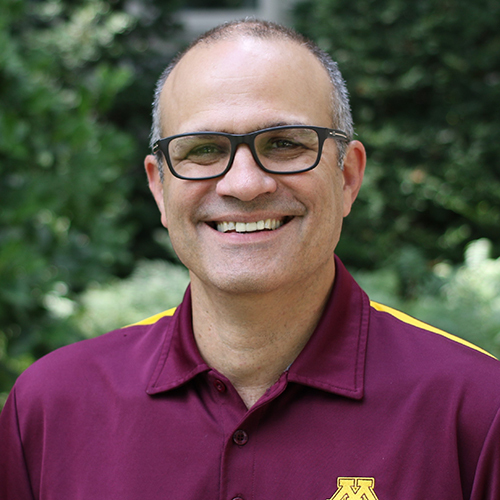 Russell J. Holmes (seed faculty) is named a recipient of the 2016 Horace T. Morse–University of Minnesota Alumni Association Award for Outstanding Contributions to Undergraduate Education. Read the full article from CEMS. 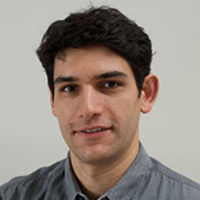 Rafael Fernandes (IRG-1) is named a 2016 Cottrell Scholar. The Cottrell Scholar program recognizes promising early career teacher-scholars of chemistry, physics, and astronomy. Read the article from the Department of Physics and Astronomy. Frank S. Bates is the winner of the Ralph S. Graph Foundation 2016 Chemistry of Thermoplastic Elastomers Award. The award recognizes researchers for significant contributions to the advancement of chemistry of thermoplastic elastomers. Bates will receive the award at the Rubber Division, ACS 189th Technical Meeting and Education Symposium occurring April 18-21, 2016 in San Antonio, Texas. Read the full article from CEMS. 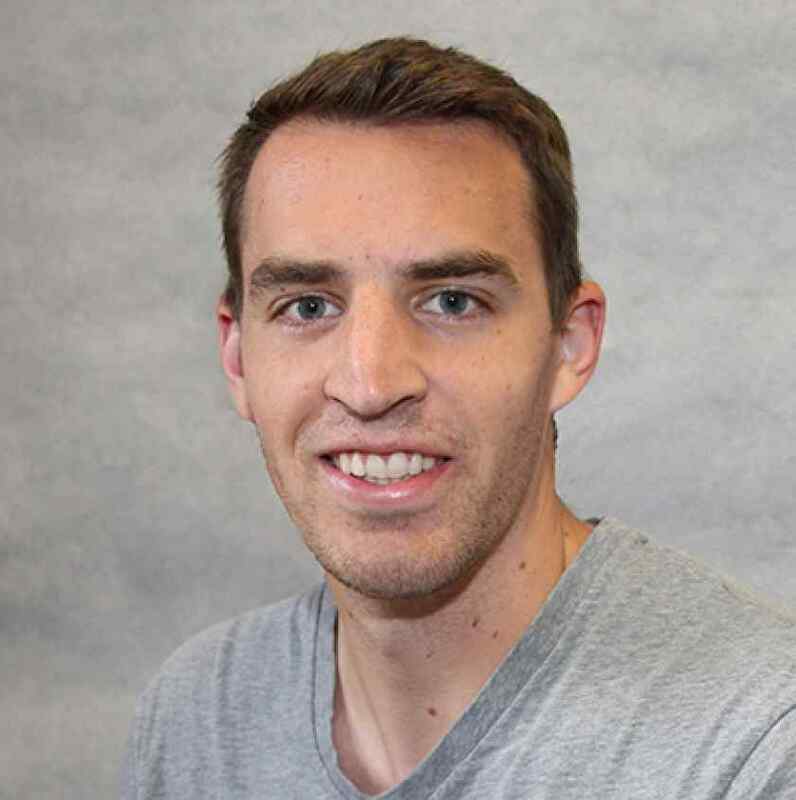 David Flannigan is named as 2015 Beckman Young Investigator for his research "Unraveling Charge/Orbital Ordering, Magnesium and Lattice Dynamics with Ultrafast Electron Microscopy" and will receive a $750,000 grant to support his research. Flannigan is the first CEMS faculty member to receive this award. Read the full article from CEMS. 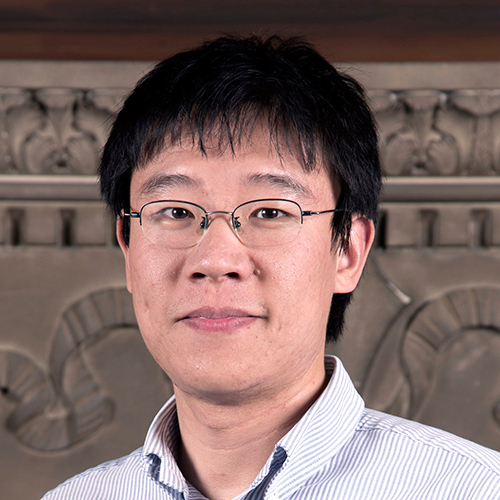 Xiang Cheng is awarded the 2015 Packard Fellowship for Science and Engineering for his research on the physics of soft materials. The Packard Fellowship is awarded to 18 of the the nation's top innovative early-career scientists and engineers. Read the full article from CEMS. Theresa Reineke will be inducted into the American Institute for Medical and Biological Engineering (AIMBE) College of Fellows. 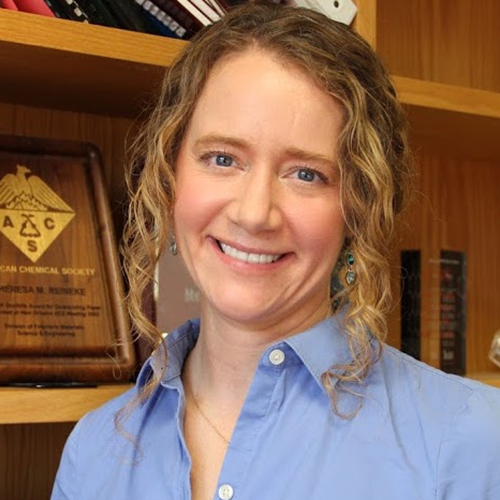 She was nominated, reviewed, and elected by peers and members of the College of Fellows for her outstanding and creative contributions to the design and discovery of synthetic polymers for drug and gene delivery. Read the full article from the Department of Chemistry. 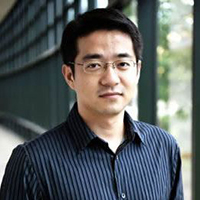 Xiang Cheng (Seed Faculty) has been named a 2016-2018 McKnight Land-Grant Professor for his research on engineering novel soft materials with controllable flow properties. Read the full article from CEMS. 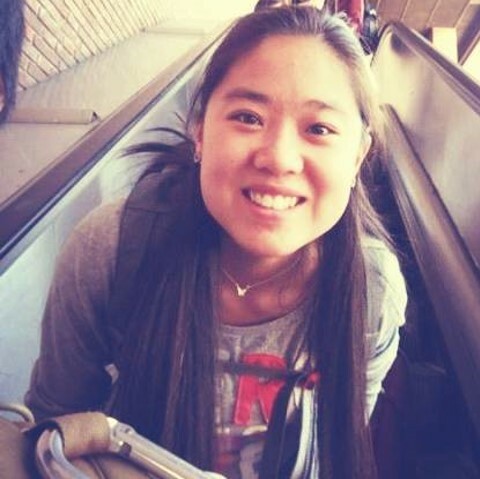 Yaming Jiang, a 3rd year chemical engineering graduate student co-advised by Professor Timothy Lodge and Professor Theresa Reineke, has been named a recipient of the Louise T. Dosdall fellowship for 2016-2017 academic year. The Louise T. Dosdall fellowship recognizes women graduate students who show exceptional promise for a successful career in research in the natural or physical sciences and engineering where women are underrepresented. The awardees are selected each year for their strength of the academic record as well as the cohesiveness and significance of the research plan. Under this one year fellowship, Jiang will continue her studies on DNA-cationic micelle complexation for potential applications in drug delivery. Martin Greven (IRG-1) has been named a Fellow of the American Association for the Advancement of Science (AAAS). Election recognizes scientifically or socially distinguished efforts to advance science or its applications. Read the full article from UMN Discover. IRG-3 research in the Hillmyer group on Nano-scale patterning of metal oxides is featured in MRS Bulletin. 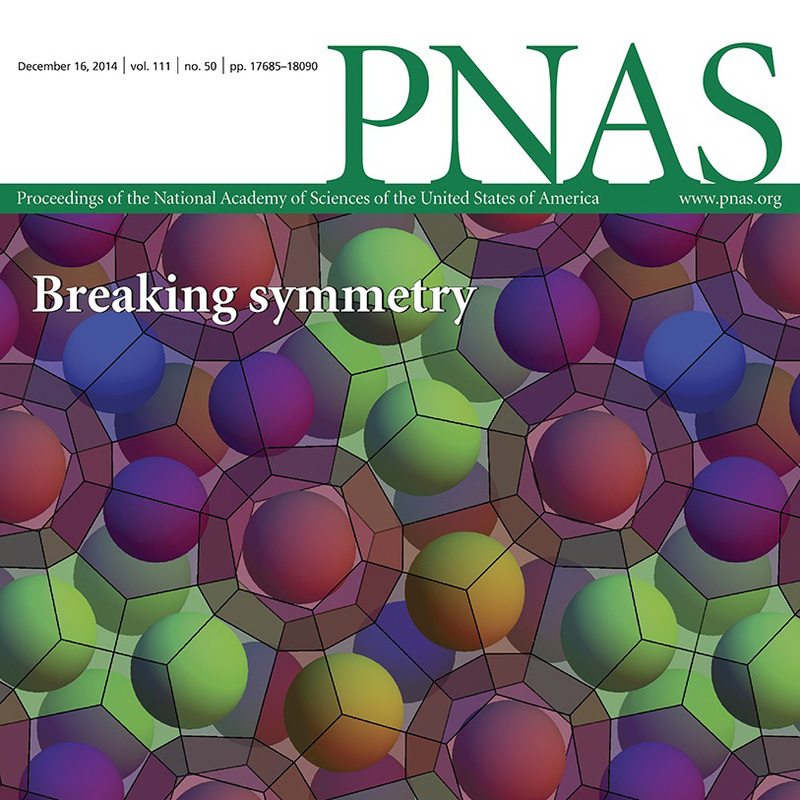 Frank S. Bates, Chris Leighton, and Sangwoo Lee, a former post-doctoral fellow and doctoral student, have been awarded a 2014 Cozzarelli Prize from the Proceedings of the National Academy of Sciences (PNAS) in Engineering and Applied Sciences. Read the full article from UMN Discover. 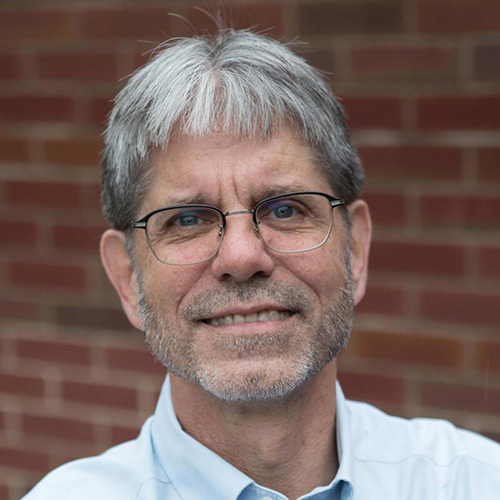 Marc Hillmyer (IRG-3) has been awarded a prestigious McKnight Presidential Endowed Chair by University President Eric Kaler. This is one of the University's highest faculty awards. 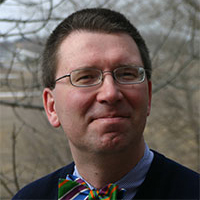 Professor Hillmyer is only the second professor in the University's College of Science and Engineering to receive the honor. Read the full article from CSE. Using one of the largest supercomputers in the world, a team of researchers, including Professor Ilja Siepmann (IRG-3), Professor Michael Tsapatsis, graduate students Peng Bai and Mi Young Jeon, and postdoctoral researcher Limin Ren, has identified potential materials that could improve the production of ethanol and petroleum products. The discovery could lead to major efficiencies and cost savings in these industries. Read the full article from UMN Discover. "Next generation technological applications of solid state physics, incorporating superconductivity and magnetism, will require a deeper understanding of the cooperative interactions between electrons in solids. In these challenging systems, termed quantum materials, the collective behavior of the electrons cannot be derived from the properties of a single electron. Fernandes' research combines theoretical models and close collaboration with experimental groups to unravel the relationship between the microscopic behavior of these materials and their alluring macroscopic properties." – quote from McKnight Land-grant Recipients page. The Gore Annex- a 40,000 Sqaure-foot expansion of Amundson Hall had its official Grand opening on Nov. 7, 2014. The new space houses expanded lab space for the department of Chemical Engineering and Materials science including new undergraduate teaching labs and the world's first FEI Tecnai™ Femto ultrafast electron microscope (UEM) lab. The renovation was funded in part by a $10 million gift from Robert and Jane Gore. Robert Gore received his Ph.D. in chemical engineering from the University in 1963 and is the inventor of GORE-TEX®. The Dow Chemical Company donated $5 million toward the project. Valspar donated $1 million to equip a new materials science lab for undergraduate students. In addition, $7 million in funding from the State of Minnesota that were part of the University of Minnesota's allocation for Higher Education Asset Preservation and Replacement (HEAPR) funds were also used to upgrade windows and other infrastructure improvements.